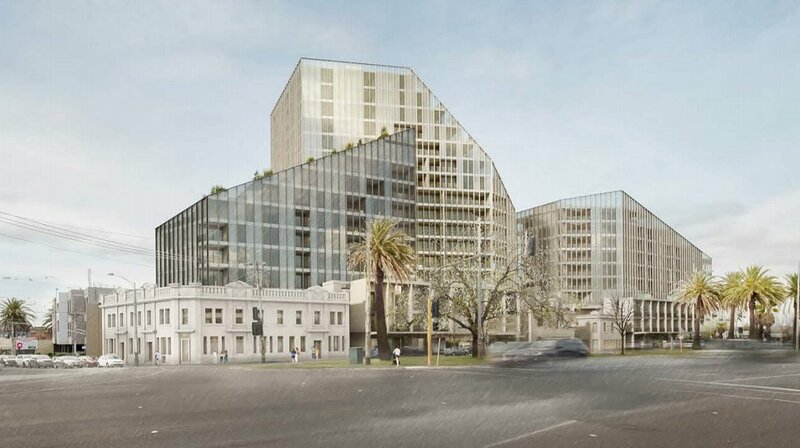 Revised plans for one of suburban Melbourne's largest developments that Urban.com.au touched upon during August are now available for public comment. The site in question sits adjacent to Malvern Railway Station and has a principal address of 641-675 Dandenong Road. At 4,739 square metres the land holding was offered for sale during 2017, with Kokoda Property subsequently revealed as the purchaser. Dubbed Malvern Collective, Kokoda Property carries imagery of the initial design on its website. The Jackson Clements Burrows-designed development seen below has been replaced by a more modest revised application which sees lower than initially intended built form across the site. The highly angular initial design for the scalene-shaped site has also been tempered to resemble more traditional buildings with a 'defined' roof. The unique qualities of the site have determined the proposals siting, massing and overall form. With interfaces to Glenferrie Rd, Dandenong Rd, Station Place and the rail corridor to the north, the lower podium is characterised by a series of articulated columns that set the rhythm of the pedestrian experience and whose datum closely aligns to that of the adjacent heritage buildings. The columns also fluctuate in depth to provide protection from traffic to the south, the summer sun to the north and visual privacy on the oblique approach. The upper forms are conceived as a series of undulating peaks that strategically lower to sensitive interfaces and minimise overshadowing to the south. The chamfered forms allow the implementation of generous east and west facing terraces which offer select apartments ‘gardens in the sky’. The mostly light coloured curtain walls and associated fins are articulated as the main facade element with the enclosed areas recessed back from the outer envelope. This provides permeability through the extremities of the building and a depth to the facade through the use of light and shadow. During 2017 Kokoda Property prompted calls for more in-fill development sites in what it calls "Melbourne’s undersupplied eastern middle-ring" in order to fill the demand for quality apartments and townhomes in the leafy suburbs. At the time Kokoda Property Sales and Marketing Director Sam Tucker spoke of the underlying demand for apartment developments across Melbourne's eastern middle-ring suburbs, driven by wealthy downsizers. This has been reflected in the recent projects undertaken locally by the developer. Malvern Collective joins a boutique current apartment development dubbed The Mowbray at Camberwell's 553-555 Burke Road and the recently completed Trentwood at 25 Trent Street, Glen Iris as examples of kokoda Property's shift in focus to inner eastern Melbourne suburbs.